Dobermans are much loved dogs for good reason. Once a dog lover purchases a Doberman, it often means that that is the only breed they will choose for the rest of their lives. Doberman dog owners therefore only ever want to buy the best dog food for Doberman dogs possible. Here, we list some high quality dog food that is suitable for the specific Doberman diet as the breed does have a certain amount of nutritional requirements that need to be met, that only the best food for Doberman dogs will manage. Puppies will also need to have suitable Doberman puppy food that meets their unique needs too. It’s hard to find fault with our top pick for a Doberman puppy food. The high amount of protein means that your puppy will gobble this all up, while you are safe in the knowledge that your large breed puppy is getting everything he or she needs from the Doberman diet. It is freeze dried so offers all the benefits of a raw diet while staying fresher for so much longer. Contains Omega fatty acids as well as a mixture of other vitamins and minerals necessary for a Doberman puppy’s health and well being. To be considered for the best food for Doberman dogs, a Doberman dog food needs to be protein rich to help keep your dog’s muscles lean and strong. This dog food is nutrient rich and highly digestible so won’t irritate your dog’s stomach yet manages to be very tasty due to the high amount of Salmon that is included that also ups the amount of Omega fatty acids included to keep your dog’s fur shiny. This is a great high quality dog food therefore to ensure that the Doberman diet requirements are met by your chosen food. Not to mention the fact that it manages to include probiotics that help keep your dog’s immune system functioning at its best. This is really a Doberman puppy food, so it is not going to be suitable for adults, but Blue Buffalo have made a great dog food here. Wet dog food isn’t for everyone, yet this is a high quality dog food that can be perfect for the Doberman diet. It is rich in Chicken that is deboned and will provide your dog with the right amount of amino acids that it needs everyday. Importantly, it is corn, wheat and soy free which can so easily irritate a young Doberman’s stomach. It is also free of artificial flavors or preservatives so you know that you are giving your Doberman puppy food that will give him or her the best start in life. Often it is recommended that the best food for Doberman dogs is that it is grain free. As a result, Wellness Complete have produced a high quality dog food that is suitable for the Doberman diet with this Chicken and Rice flavored kibble as it is contains no wheat, corn or soy. These are often thought of as low quality fillers that are simply there to pad out dog kibble. The rest of the ingredients in this Doberman dog food are also all high quality so that there are no horrible artificial colorings, flavorings or preservatives. Instead, this is a kibble that is high in vitamins and minerals like glucosamine and chondroitin which will help keep your dog’s hips and other joints healthy. It’s hard not to love this high quality dog food from Rachael Roy that is great to serve as a speciality Doberman puppy food. That’s down to using chicken as its primary ingredient so that your puppy gets all the protein it needs for its growing muscles to remain lean and strong. The rest of the formulation works hard to help support a healthy heart as well as a well functioning immune system that is aided by a recipe rich in fruits. For example, it contains cranberries which are a fantastic source of antioxidants. As all of the best dog foods for Doberman dogs should do, it is totally free of by product meal, artificial flavors, colors and also artificial preservatives. The fish meal it contains also helps work towards brain development and healthy vision due to the high concentration it has of DHA. The Doberman diet is well served by this bag of Newman’s Own Adult Dog Food. Not only does buying a bag help support Newman’s charity, it is also great Doberman dog food for a number of reasons. Firstly, it is high in protein with Chicken being its primary ingredient. Its carbohydrate constituent comes mainly from brown rice which is a complex carb that will give your dog energy in a slow burning way as opposed to the low quality fillers that less reputable brands use within their food. It also means that no wheat or corn is present which can irritate a Doberman’s sensitive stomach. Additionally, this is an example of one of the best food for Doberman dogs as the kibble is crunchy enough to help keep their teeth clean, while there is no use of artificial colors or flavorings. Finally, we like that it is totally free from any added antibiotics or other harsh chemicals. 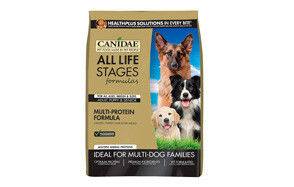 Canidae have produced one of the best food for Doberman dogs here with their all stage kibble. The company have worked hard to come up with a formulation that is high in protein and as such have included four types in this high quality dog food. Dobermans will therefore love eating it owing to the fact that chicken, turkey, lamb and fish are all added to help promote lean muscle in your Doberman’s body. 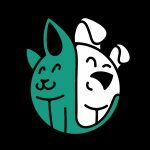 The company have also taken great care to ensure that no corn, wheat or soy is included that may upset a Doberman’s tummy, while meanwhile coming up with a recipe that is easy for your dog to digest while promoting a healthy immune system and shiny coat with the inclusion of Omega fatty acids. This can also be used as Doberman puppy food and contains a high amount of glucosamine and chondroitin which is essential to a young dog’s development. If you have more than one dog or one Doberman in your family, of various ages, this is the dog food for you. This specially formulated all natural dog food for adult dogs from AvoDerm is perfect for the Doberman diet. As mentioned before, the best food for Doberman dogs are ones that are high in protein and contain no low quality fillers. The mean ingredient in this kibble from AvoDerm is Chicken, but it also has a high percentage of brown rice within it, which means the manufacturers have had no need to include wheat or corn. It also does not contain any artificial flavors yet does include a high percentage of Avocado so that this Doberman dog food provides your dog with the right amount of support for your dog’s joints, bones and muscles to be healthy, while also maintaining a shiny coat. This wet food is perfect Doberman puppy food with its high percentage of the best quality chicken and barley that it contains. 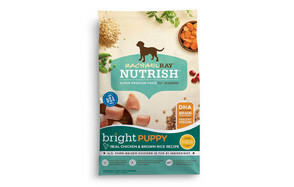 All the key nutrients, proteins, vitamins and minerals are included within the food stuff, which works towards providing a puppy with the best start in life. This means that the food is easy for your Doberman to digest, while your dog will love it owing to its great flavor. Hill’s Science have worked hard to find a formulation that helps build a dog’s immunity while also encouraging healthy bone and joint development, which is crucial to their wellbeing later on in any Doberman’s life. Your puppy will find that it is kept at the optimal weight for its height, size, breed and energy level with this food, so you have nothing to worry about. Holistic Select have made this larger than normal size kibble especially with large breeds in mind so it is amongst one of the best food for Doberman dogs available to buy on the market. This is thanks to the well balanced formulation that has be designed to aid better digestion so that Dobermans do not suffer from bloating or any other conditions that they are susceptible to, owing to their size. There are absolutely no meat by products or use of flavorings or colors to improve the kibble’s taste to dogs. The company have ensured that they only use real chicken so that the protein needs of a Doberman are met perfectly. Dobermans need a large amount of protein in their diet. Fish and meat are great sources of protein, with fish also being a great place to find additional omega fatty acids. Look for dog foods that list meat as their first ingredient and ensure that it is a real meat - not just a meal. We’ve been told for so long that fat is bad for us, but not all fats are bad. This is especially true in Dobermans who need good fats to help keep them looking great. Look out for omega fatty acids. These can be found in salmon oil, flaxseed oil and avocados. Not all dobermans will have a stomach that agrees with grains, but if they do try to make use of that by finding foods high in whole grains as they’re great for digestion being an excellent source of fiber. Like us, dogs need fruit and vegetables too as a source of fiber, vitamins and minerals. They’re also a great source of antioxidants that can help keep your dog healthy and reduce their risk of heart disease, diabetes or cancer as well as just general day to day niggles. Some of the best fruit and veg to keep an eye out for are sweet potatoes, carrots, blueberries and apples. Protein is needed to sustain a Doberman’s energy and strength. The best Doberman dog food will have protein making up anything from 15 to 30% of its ingredients. The best Doberman puppy dog food will have 22% to 32% of its ingredients being protein based. Be careful not to go over these limits however, as a diet too high in protein can aggravate kidney disease. Fat is needed in the best dog food for Doberman dogs as it is how this breed, and others, maintain a sleek and shiny fur coat, as well as healthy skin. In particular look for Omega 3 and Omega 6 fatty acids. Doberman dog food is at its best when it contains complex carbohydrates which helps prevent the onset of of hypoglycemia and hypothyroidism. Excellent complex carbs are whole grains, but slow burning fruits and veggies are suitable too if your dog suffers from an allergy to grains. It’s odd to think, but Dobermans despite their size and strength actually have very sensitive stomachs which is why care needs to be taken in the approach to a Doberman diet. 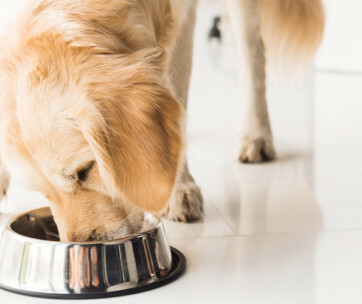 Meat by products can be one of the ultimate reasons a dog suffers from an upset stomach as they are not regulated enough to ensure that they are safe to eat. We all like to see our Dobermans gobbling up the dog food that we have left out for them, but that is not to say that artificial flavors should be added to promote this. Given the breed’s propensity to allergies, it’s best to stay clear of artificial colors and flavors that can irritate a stomach. Low quality fillers should not have any place in the Doberman diet. The best food for Doberman dogs or the best food for Doberman puppy dogs will contain whole grains, fruits and vegetables while staying well clear of wheat, corn and other glutenous fillers. Bloating - bloating is far more serious than owners give it credit for. It can cause gagging, abdominal pain and excessive slobber. Kidney disease - Kidney disease stops this important organ from functioning properly. They kidneys are needed to remove toxins from a dog’s body that can cause harm in too high doses. Wobblers syndrome - this is a neurological disorder that can cause neck pain and a weakness of the hind legs. One of is main symptoms is a wobbly walk. Hypothyroidism - Large dog breeds are susceptible to hypothyroidism, which is not life threatening by can cause dry skin, lethargy and depression. The best food for Doberman dogs will aid their immune systems so that their risk of developing these conditions is much diminished. Q: How often should my Doberman eat? 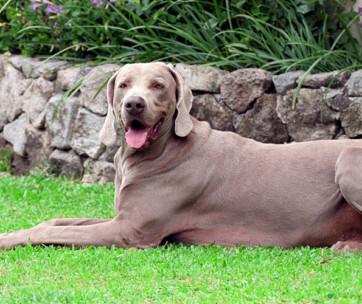 A: Even the best dog food for Doberman dogs can still cause bloating if not given to them in the correct amounts. It is therefore a good idea to feed your Doberman high quality dog food, little and often. 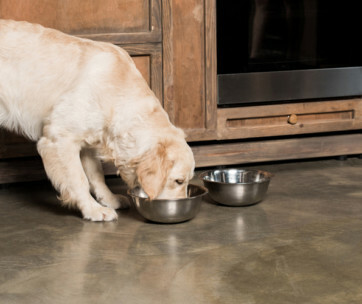 This can mean that owners split their dog’s food down into several meals as opposed to one or two. Q: How much puppy food should I feed my Doberman puppy? A: While Doberman puppy food is a fantastic start to giving your dog the best Doberman diet possible, it is still possible to feed them incorrectly by overfeeding them or underfeeding them. All Doberman puppies need special care and attention. They need to be fed three times a day and the amount needs to change as their age and activity levels increase. For specific weights, ensure that you consult both your chosen Doberman puppy food instructions as well as your vet if you are even the tiniest bit unsure. 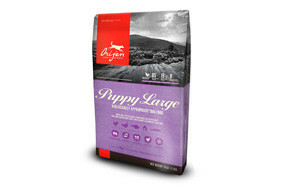 Orijen has made a high quality dog food here that is the best food for Doberman puppy dogs that money can buy. It is jam packed full of the vitamins and minerals a young dog needs for a quality Doberman diet, yet it is incredibly tasty too owing to the high amount of protein included. It’s freeze dried so has the added benefit of what a raw diet can offer yet has the staying power of a high quality dog food kibble.